Check out all courses on our map! 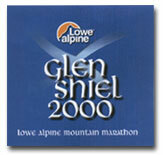 Throughout LAMM Glen Shiel 2000 you will be able to find all the essential information and in depth race coverage in this race reports section. To enable you to keep up to date as easily as possible the reports will appear on the page in the order in time order, so the latest report will always appear right at the top. Just what do you need to pack? This webcast has been sponsored by 9FEET.COM, one of the many outdoor events we cover. Why not register to receive news of further 9feet events and webcasts?